Welcome to the first and only website deidcated to the musical legend who has blessed the world with so many magical songs. Those who are fans of Ralfi's music know that his sound is one-of-a-kind and his works are truly something special. 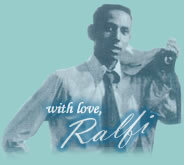 And if you don't know Ralfi? Well, then I suggest you have a look around. This site it dedicated to the memory of Ralfi Pagan, his music, and his fans.